In a previous blog, we had discussed some of the recent updates announced by CMS for MIPS. One of those updates was the release of Quality benchmarks for 2018. 1. What are the data sources for these benchmarks? Benchmarks for Quality measures in 2018 are based on actual performance data from performance year 2016 which was submitted to the Physician Quality Reporting System (PQRS) in 2017 (except for CMS Web Interface and CAHPS for MIPS survey). 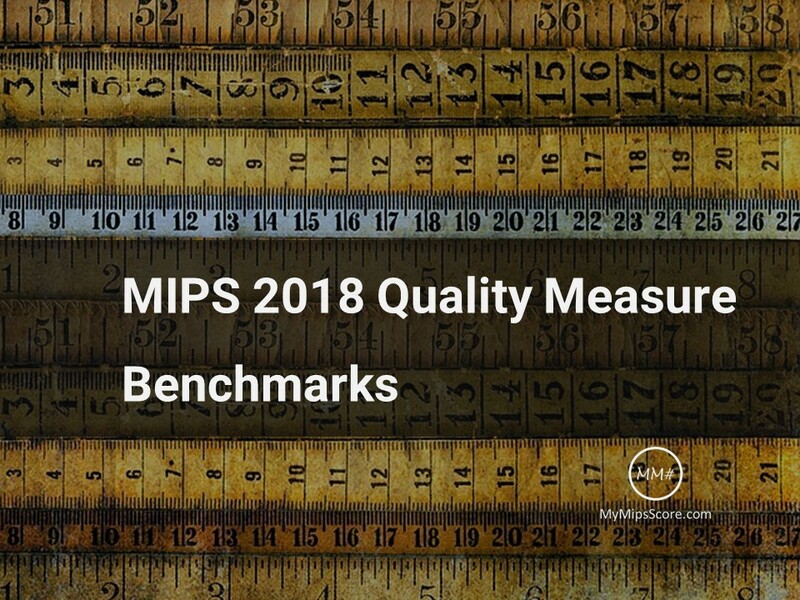 PQRS data is being used to calculate the transition benchmarks till data from MIPS performance years for adequate historical benchmark determination becomes available in 2019. For CMS Web Interface, the benchmarks from the Medicare Shared Savings Program will be used. We have to wait a little longer for CAHPS for MIPS 2018 benchmarks though. A revised CAHPS survey is being implemented in 2018 and thus the benchmarks will be created based on 2018 data for each of the CAHPS Summary Survey Measures (SSM). 2018 Benchmark for the All Cause Hospital Readmission (ACR) Measure will be created using the 2016 data for PQRS / Value Modifier Program and will be available in early 2018 according to CMS. 2. Which data is included? For establishing benchmarks that are fair and applicable to MIPS, the PQRS data was filtered by 2018 MIPS eligibility criteria and the volume threshold (more than $90,000 in Medicare Part B allowed charges and provided care for more than 200 Medicare Part-B enrolled beneficiaries). Only the data for clinicians and groups who satisfied both the aspects for inclusion in 2018 MIPS performance year was used for the historical benchmark determination. Comparable data from the Alternative Payment Models (APMs) was also used when feasible. 3. When is a benchmark created? If at least 20 clinicians or groups who satisfied the inclusion criteria reported on a measure, met the case minimum of 20 and the data completeness of 60%, and had performance rate greater than 0% (or less than 100% for an inverse measure) a benchmark was created for that measure. 4. What happens when there is no historical data? In the absence of historical benchmark for a measure (e.g. new QCDR measures, Revised CAHPS for MIPS), CMS will try to calculate a benchmark based on 2018 performance data, provided all the requisites for benchmark creation mentioned above are met. Although there are some significant changes for Quality scoring in 2018, the logic for benchmark calculation, decile distribution, and how points are earned basically remains the same as that of 2017. 3-10 points (achievement points) can be earned for each measure provided the data completeness of 60%, case minimum of 20 (except all-cause hospital readmission measure), and minimum performance rate of >1 are met. Bonus points can be in earned in addition to the achievement points whenever applicable. Separate Benchmark for Each Submission Method - The Quality measures can be submitted via Electronic Health Records (EHRs), Qualified Registries, Qualified Clinical Data Registries (QCDRs), Claims, CMS Web Interface, and CAHPS for MIPS Survey submission methods. Benchmark for each measure is uniquely determined for each submission method through which it can be submitted. So, it is quite possible that a measure that is available to report via multiple submission methods has a benchmark for one submission method, but not for the other. Pay close attention. The importance of submission methods cannot be emphasized enough when it comes to Quality score calculation. It is crucial to understand the difference between the submission methods before picking one. Just like in 2017, only one submission method will be allowed for the Quality category. This is one of the most important aspects about the Quality measure benchmarks and scoring. We will be looking at this in greater detail during our upcoming webinar. There are some measures that don’t have historical benchmarks for all the deciles. This happens when about 10% - 60% clinicians perform at the maximum achievable performance rate. Although these measures are not topped out yet, but they are close. Practices planning to submit such measures must do so while being aware of this fact, and not because they have been submitting those measures under previous quality programs. To arrive at Quality performance category scoring, the benchmarks need to be evaluated in conjunction with the submission method, measure bonus criteria (Outcome, Priority, Patient Experience), the end-to-end reporting, the case minimum, the data completeness, and the quality performance improvement score. Newer PostPromoting Interoperability: What's New in MIPS 2018?